1. Drosophila oogenesis is dependent on environment, age, and mating status of the female. Therefore, for both BrdU labeling and nuclear flow sorting, it is critical to use mated females of optimal age that are well fed and watered. This entails conditioning females on wet baker's yeast (the consistency of creamy peanut butter) for 2 d, followed by one more day on fresh wet yeast (a total of 3 d of conditioning). The females should have eclosed from the pupal case at least 3 d and no more than 8 d before the day of dissection (4-6 d post eclosion is optimal in most cases). Because oogenesis proceeds apace only if females have recently mated, males should be present during conditioning. 2. Treat eppendorf tubes and Pasteur pipets with 5% BSA solution to discourage sticking of the ovaries. Pipet 1 mL of 5% BSA into a tube, close the cap and invert, remove the BSA to the next tube to be treated, and so on. Treat pipets by pipetting the solution up and down once. (12.5 units/mL DNase buffer) at 37°C for 30 min (DNase I: Roche cat. no. 776785). Proceed to Subheading 3.1., step 10. 4. After collagenase treatment, the EBR may become slightly viscous, making it difficult for the ovaries to sink to the bottom of the Eppendorf tube. If this occurs, gently centrifuge the ovaries in a microfuge for 2-3 s to bring them to the bottom of the tube. 5. Crude but effective filters can be easily generated by supergluing a small section of Nitex mesh onto the end of a 1.5-cm section from a 5-mL plastic pipet that has been cut for this purpose. These sieves fit snuggly into 1.5-mL Eppendorf tubes. 6. As an alternative to DAPI, the nuclei can be stained with the nucleic acid dye propidium iodide. However, because propidium iodide (PI) stains both RNA and DNA, it is necessary to remove the RNA before analyzing the nuclei. After resus-pending the nuclei in 500 ||L of 1X nuclear isolation buffer in Subheading 3.2., step 10, add 5 |L of a 10-mg/mL RNase A solution to obtain a final concentration of 100 |g/mL. Incubate for 15 min at room temperature. Next add 2.5 |L of a 1-mg/mL PI stock solution to the nuclei. Let the nuclei stain for at least 15 min at room temperature before the analysis. The RNase A digestion and PI staining can be done concurrently. To obtain a flow cytometry profile, examine the propidium iodide stained nuclei using an argon 488 nm laser collected through a 545/642 bandpass filter. 1. Painter, T. S. and Reindorp, E. (1939) Endomitosis in the nurse cells of the ovary of Drosophila melanogaster. Chromosoma 1, 276-283. 2. Hammond, M. P. and Laird, C. D. (1985) Chromosome structure and DNA replication in nurse and follicle cells of Drosophila melanogaster. Chromosoma 91, 267-278. 3. Beckingham, K. and Thompson, N. (1982) Under-replication of intron+ rDNA cistrons in polyploid nurse cell nuclei of Calliphora erythrocephala. Chromosoma 87, 177-196. 4. Beckingham, K. and Rubacha, A. (1984) Different chromatin states of the intron and type 1 intron+ rRNA genes of Caliphora erythrocephala. Chromosoma 90, 311-316. 5. Renkawitz-Pohl, R. and Kunz, W. (1975) Underreplication of satellite DNAs in polyploid ovarian tissue of Drosophila virilis. Chromosoma 49, 375-382. 6. Lilly, M. and Spradling, A. (1996) The Drosophila endocycle is controlled by Cyclin E and lacks a checkpoint ensuring S-phase completion. Genes Dev. 10, 2514-2526. 7. Calvi, B. R., Lilly, M. A., and Spradling, A. C. (1998) Cell cycle control of chorion gene amplification. Genes Dev. 12, 734-744. 8. Dej, K. J. and Spradling, A. C. (1999) The endocycle controls nurse cell polytene chromosome structure during Drosophila oogenesis. Development 126, 293-303. 9. Spradling, A. C. (1993) Developmental genetics of oogenesis, in The Development of Drosophila melanogaster (Martinez-Arias, A. and Bate, M., eds. ), Cold Spring Harbor Laboratory Press, Plainview, NY. 10. Calvi, B. R. and Spradling, A. C. (1999) Chorion gene amplification in Drosophila: a model for metazoan origins of DNA replication and S-phase control. Methods 18, 407-417. 11. de Cuevas, M., Lilly, M. A., and Spradling, A. C. (1997) Germline cyst formation in Drosophila. Annu. Rev. Genet. 31, 405-428. 12. Margolis, J. and Spradling, A. (1995) Identification and behavior of epithelial stem cells in the Drosophila ovary. Development 121, 3797-3807. 13. King, R. C. (1970) Ovarian Development in Drosophila melanogaster, Academic, New York. 14. Koch, E. A. and King, R. C. (1964) Studies on the fes mutant of Drosophila melanogaster. Growth 28, 325-369. 15. 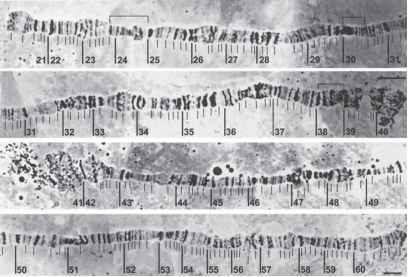 King, R. C., Riley, S. F., Cassidy, J. D., White, P. E., and Paik, Y. K. (1981) Giant polytene chromosomes from the ovaries of a Drosophila mutant. Science 212, 441-443. 16. Keyes, L. N. and Spradling, A. C. (1997) The Drosophila gene fs(2)cup interacts with otu to define a cytoplasmic pathway required for the structure and function of germ-line chromosomes. Development 124, 1419-1431. 17. Heino, T. (1994) Polytene chromosomes from ovarian pseudonurse cells of the Drosophila melanogaster otu mutant. II. Photographic map of the X chromosome. Chromosoma 103, 4-15. 18. Calvi, B. R. and Spradling, A. C. (2001) The nuclear location and chromatin organization of active chorion amplification origins. Chromosoma 110, 159-172. 19. Spradling, A. and Mahowald, A. (1980) Amplification of genes for chorion proteins during oogenesis in Drosophila melanogaster. Proc. Natl. Acad. Sci. USA 77,1096-1100. 20. Royzman, I., Austin, R. J., Bosco, G., Bell, S. P., and Orr-Weaver, T. L. (1999) ORC localization in Drosophila follicle cells and the effects of mutations in dE2F and dDP. Genes Dev 13, 827-840. 21. Schwed, G., May, N., Pechersky, Y., and Calvi, B. R. (2002) Drosophila minichromosome maintenance 6 is required for chorion gene amplification and genomic replication. Mol. Biol. Cell 13, 607-620.